I can remember way back when I was 4 years old sitting outside on top of big rocks underneath trees contemplating my life. I sat in ‘easy pose’ and thought about how my life was going. I literally had conversations with the clouds as they formed into different shapes. Little did I know that I was meditating. It wasn’t until my fathers sudden death that I decided to take my first yoga class. I took a kripalu yoga class on my 22nd birthday at Lowes Ventana Canyon in Tucson, Arizona. I remember feeling an ease of joy and serenity that lasted long enough for me to appreciate the benefits that yoga offered. 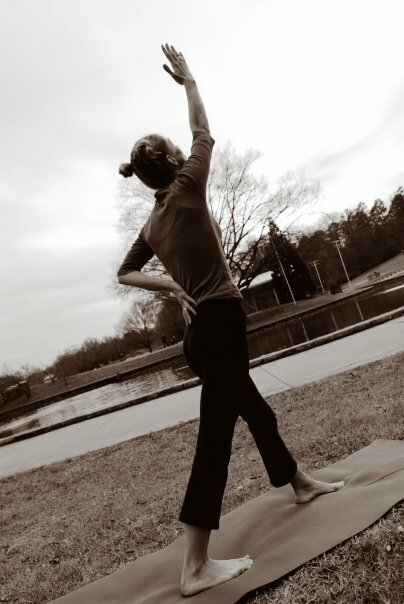 A few months later I was guided back to the yoga mat after my mother suggested I do yoga to help ease my stress, anxiety, depression and insecurities. I never imagined that these simple exercises could transform my life in the way that they continuously do. My process is ever-changing and with each challenge that I face, I always go to my yoga mat for guidance and peace. It started as a coping mechanism for the coping of my father’s death , which then turned into a physical practice that I depended on, but has now turned into a therapeutic, restorative and wellness tool. When I started my practice, my body felt a lot of aches and pains. It was obvious to me that the combination of depression and quitting antidepressants was causing me to feel this way. It was my desire to enhance my mood and detox the pharmaceuticals that lead me to approach my practice from a more physical place. This is why ashtanga yoga or power yoga best suit me. I enjoyed the core workout combined with the fast paced Sun Salutations A and B. I liked the heated room and the upward dogs and downward dogs between each pose. Whenever my teacher(s) would cue childs pose or upward dog/downward dog, I was always the student who took the challenge. I was listening to what my ego wanted and not what my body needed. Looking back, I ask myself ‘was I really practicing yoga?’ In many ways I was. I had strong breath control and my mind was very focused. I loved meditation at the end of class and I was always honored when my main teacher would ask me to lead the ‘om’. However, I am aware now of that part of me that was not doing yoga simply because I was not honoring my body. I was pushing to hard and letting my ego guide me. None of this occurred to me until I found other practices that lead me through different sequences. Don’t get me wrong, I still appreciate my earlier experiences with ashtanga /power yoga, but I greatly appreciate other styles that are more gentle. I appreciate how going slower can be just as challenging as going fast. I appreciate holding the poses for longer periods of time and how with each breath I can move deeper and still release aches and pains. I also find myself going through phases where I only want to practice at home or at other times I just want to go to a studio and connect with community. Overall, I see the practice of yoga as a personal journey and through each phase of life we approach the practice in the area that best suits us then.